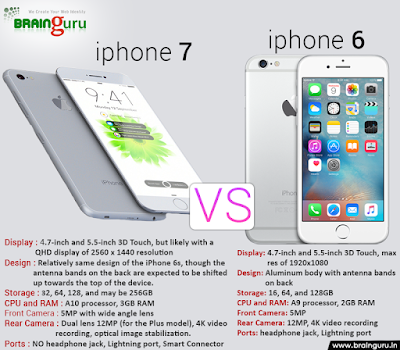 Difference Between iPhone 7 and iPhone 6s | Brainguru Technologies Pvt Ltd.
Last night Apple launch iPhone 7 and iPhone 7 Plus with advance features. Design: Relatively same design of the iPhone 6s, though the antenna bands on the back are expected to be shifted up towards the top of the device. Rear Camera: Dual lens 12MP (for the Plus model), 4K video recording, optical image stabilization. As far as specs go you can expect the iPhone 7 to see a new A10 processor and M10 motion-coprocessor. They’ll no doubt be an improvement over the A9/M9 found in the current iPhone 6s, but by how much, who knows? If you go by averages, you can expect about a 20% speed bump from the processor. With the iPhone 6s Apple boosted the RAM to 2GB. There’s a chance the iPhone 7 will boast 3GB of RAM, though Apple doesn’t like making RAM upgrades every year. However, because of the lack of major design changes expected to the iPhone 7, Apple’s going to have to add some pretty good internal changes to get people to upgrade. 3GB of RAM could do the trick. As for storage options, with the iPhone 7 we finally expect Apple to drop the 16GB entry level option for a 32GB entry level model. But what’s really interesting is the iPhone 7 could feature up to 256GB of storage space. If Apple keeps with its current 3-tier storage offerings, that means the iPhone 7 could come in 32, 128, and 256GB models.